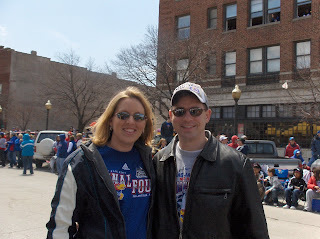 KT's Family Stories: Go Jayhawks! Lots of news since the last update. The most widespread news is that our local college basketball team won the national championship. Go Jayhawks! 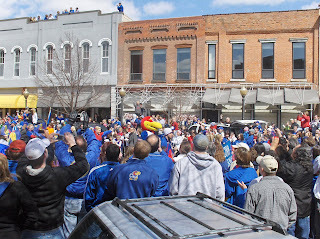 We watched the exciting tournament over the course of a couple weeks and each time they won a game, the city of Lawrence went nuts! When they won the championship we joined in the madness. On Sunday, the city held a parade on Massachusetts street. They say over 80,000 people attended! 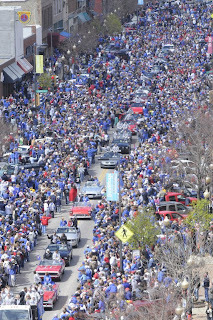 The population of Lawrence is only 80,000! I believe the numbers though, there were a ton of people! It was like Main Street, Disneyland during the fireworks! Madness. But fun, fun. Here are some pictures of the craziness. In other news, I am now very pregnant. 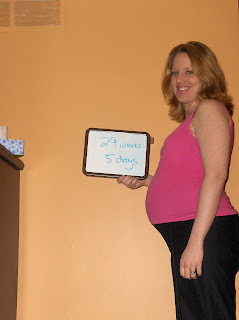 Very pregnant. I can hardly believe this picture is me. But, I only have about 10 weeks left so, it's only bigger from here! We have been busy, busy. Now that the weather is starting to warm up (sort of), we are working on our floors again. We should be done with the entire house in the next couple of weeks. That is dependent of course on us not having anymore snow flurries like we did this past Saturday. We have also started our pre-natal classes. Let me say... ack! Lots of information, almost more than we can process in one evening. But, it is really good too. We have a couple more weeks of class. I guess they expect us to be experts after that... In a couple weeks we will tour the hospital that I will deliver in over in Overland Park, Kansas. We have a baby shower scheduled for early May, which will be fun. Several ladies from church are hosting it and we will probably be well prepared after that. Some tiny sad news, I have informed my job that I will not be returning to work after this summer. We are starting to choose candidates to interview and it is a bit hard to give up this job I love to anyone else. But, when I think of the alternative, I know this is right. But it is pretty nerve-wracking. So, that catches you all up for now. The baby is moving a lot these days. On Sunday I think she learned to turn somersaults because she was flipping over all day! It is a pretty neat time. YAY JAYHAWKS! Wathced the game and wasn't it a last minute heart pumping event! You are totally gorgeous and pregnant, dad and I just keep remembering our little girl when we think of you and then realizing....bam you are a woman not out little child. What a blessing you, Kevin and grandchild are to us. Your Mom only beat me because I let her. I am a giver. Thanks Amy for giving me the opportunity to gloat once and only once. Tonya Kevin are going to be parents!!!! Just a grangran moment(Courtney has found a name for me, thanks girl ha). Hey guys, we can't wait to hear when the baby comes! Kevin, we need to get your email address and we'll send you an invitation to our blog so you can see some pictures of Ava! We miss you guys!